The vast wilderness of Olympic National Park is a place where our planet’s bountiful diversity is on constant display. Within these million acres of park land, visitors will find thousands of years of human history and a fascinating range of ecosystems, from glacier-capped mountains and old-growth rain forests, to 70+ miles of rugged coastline. The Olympic National Park is a destination in and of itself, and Sequim is the gateway to these wild lands. Whether you plan to travel to the highest peaks, wander into the deepest parts of the forest, or explore the wild coastal lands, this World Heritage Site won’t leave you disappointed. Whether for a few hours, days or weeks, come join the millions of people visit the park each year. There is no better place to experience beauty, diversity, and opportunities for adventure and exploration than in the Olympic National Park. 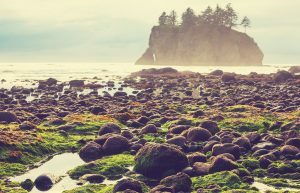 Whether it’s boating, camping, climbing, hiking fishing, or wildlife viewing, you can do it all on the Olympic Peninsula. 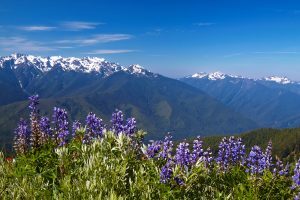 There are more places to explore than can be mentioned, but the top destinations within the Olympic National Park are all easily accessible from the charming towns of Sequim and Port Angeles. 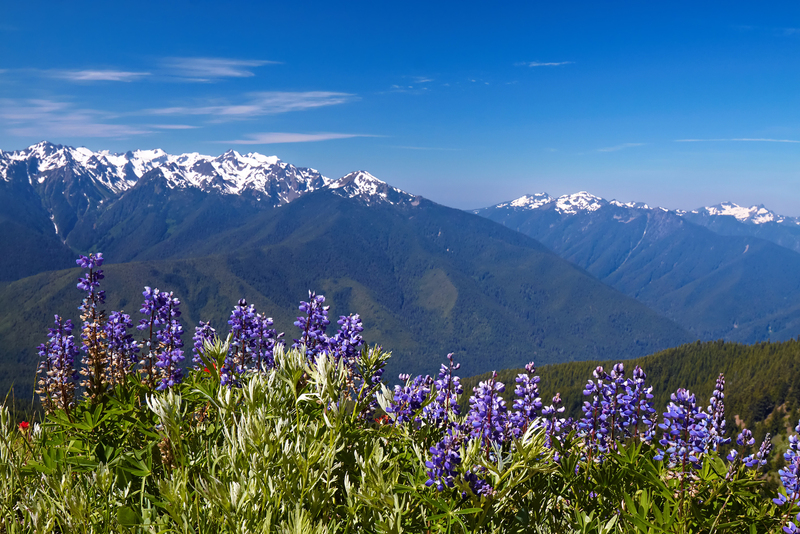 Hurricane Ridge is the most easily accessed and popular mountain area in the Olympic National Park. From the top, a clear day will reward you with stunning views of the Olympic Mountains, and down to the Dungeness Spit and across the Strait of Juan de Fuca into the Victoria Harbor. Wildflowers light up the mountain meadows with colorful displays, and hiking trails lead you across the ridges, where they descend to subalpine lakes and valleys. Obstruction Point is a popular hiking trail here, which leads to stunning views of the park itself and Mount Olympus. Nestled in the foothills of the Olympic National Park, Lake Crescent is one of the most picturesque lakes around. You’ll never forget the view gazing across the pristine waters of this deep, glacially carved lake. The Lake Crescent Lodge is a beautiful, historic lodge located on Barnes Point. The lodge was built in 1915, and provides guests with the quintessential lakefront experience in the park. From here, you can access the easy hiking trails to Marymere Falls, or the more challenging but rewarding Storm King Trail. The Sol Duc Valley is as beautiful as it is tranquil. There are a variety of hiking trails that leave from this area that lead to Old-growth forest, subalpine lakes, and snowy peaks. However, the most popular is the trail follows the Sol Duc River to Sol Duc Falls, just over a mile away. After a short hike, don’t miss your chance to take a dip in the pools at rustic Sol Duc Hot Springs Resort. The coastline of the Olympic National Park is gorgeous. The inland area, known as Mora, is home to towering trees and lush undergrowth, with the ever-present sound of the ocean waves pounding at the shore in the background. You’ll emerge from the lush forest onto the rugged and expansive Rialto Beach. Rialto Beach is amongst the most popular, though there are many, many more beaches worth visiting as well, including La Push’s 1st, 2nd, and 3rd beaches. While here, definitely take the time to explore Hole-in-the-Wall is a sea-carved arch about 1.5 mile north of Rialto Beach. The Hoh Rain Forest is indescribable, and definitely a must-see attraction within the Olympic National Park. The lush, green canopy, and the mosses and ferns that blanket the forest set a truly beautiful scene. Undoubtedly, the Hoh Rainforest is one of the finest remaining examples of temperate rainforest in the United States, and one of the most popular destinations on the Olympic Peninsula. For the day-tripper, there are two short nature trails worth enjoying: The Hall of Mosses Trail and the Spruce Nature Trail. Other popular trails for serious hikers include the Hoh River trail, which leads 17.3 miles to Glacier Meadows onMount Olympus, and the Hoh Lake trail, which ascends to Bogachiel Peak between the Hoh and the Sol Duc Valley. Our Sequim Real Estate Agents take great pride in introducing people to the incredible adventures waiting for them on the Olympic Peninsula. Contact us today, and let us help you make a smooth transition to living on the stunning Olympic Peninsula.